 Partyvagn typ WGmh 804/854 "Euro-Express"
Partyvagn typ WGmh 804/854 "Euro-Express"
By buying this product you can collect up to 3498 bonuspoints. Partyvagn typ WGmh 804/854 'Euro-Express', vagnen har mfx digitaldekoder, innerbelysning, micro SD kort, med musik och ljud, 6 figurer medföljer, längd över buffertar 28,2 cm, epok VI. Model: The type WGmh 804/854 entertainment car is partially new tooling, here as a model of a soccer fan car. The car has an mfx digital decoder. Sound functions are provided from a Micro SD card. The car has factory-installed interior lighting that can be controlled digitally. The bar lighting can be controlled digitally. Warm white LEDs are used for the interior lighting and bar lighting. The car has current-conducting couplers that can be controlled digitally (note instructions for use). A 2 GB micro SD card with royalty-free songs and sounds is built in. The music and the sounds can be played with the respective function buttons. Music and sounds of your own can be exchanged or added (Please see instructions on the micro SD card). The micro SD card is removed on the car floor to do this. A conversion program is already stored on the micro SD card. The 2.5 to 3 watt speaker provides optimal sound quality. The volume can be changed. A card reader and adapter are not included with the car. A 6-piece set of figures (soccer fans of 1.FC märklin) from the firm NOCH are included (read the instructions for use). Length over the buffers approximately 28.2 cm / 11-1/8'. 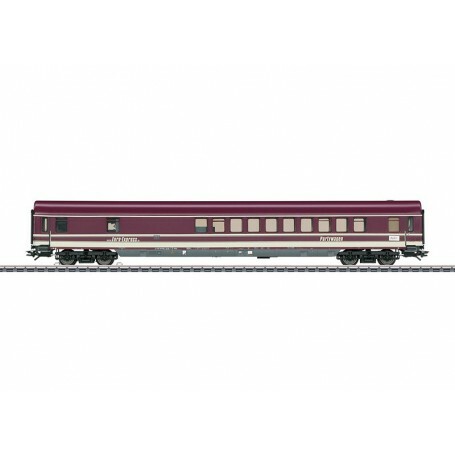 Passenger car sets with 2 and 3 cars to go with this car are offered exclusively for the MHI under item numbers 43946 and 43947.The class 146 electric locomotive to go with this set is offered exclusively for the MHI under item number 36626. Speaker with top sound quality.